We offer a wide range of Food Microbial Paddle Blender and is used to produce homogenization by a combination of mechanical forces. The Stomacher Circulator principle improves organism recovery over older square paddle designs by enhancing the stirring and extrusion forces applied to the sample and in doing so driving more organisms into suspension for analysis. 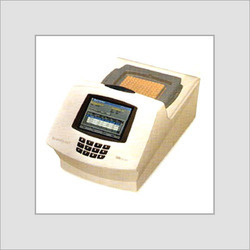 We offer a comprehensive range of Thermocycler Equipment, which is procured by a leading company named Sensoquest. It is a Germany based company. These thermocyclers come with solid metal design, which is of a precise and high-quality workmanship. In addition, these products are provided with peltier elements of the latest generation offer high speed and long life. Further, these system has scope for future expansion. Having unique system for exchanging the thermo block, there are two block formats.